UCSB police officer Sgt. Tony Borrayo died in his sleep at his home on January 4. He was 46 years old. A Santa Barbara native, Borrayo graduated from Dos Pueblos High School and attended Santa Barbara City College. 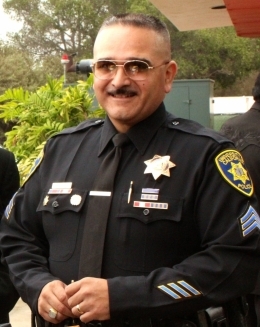 Borrayo started working at the UCSB University Center in 1994 and later worked in the Transportation and Parking Services Department. Chancellor Henry Yang said in a statement that Borrayo was known for his commitment to community policing. “He cared deeply about the safety and welfare of our students and all members of our community,” Yang said. Recently, Borrayo had worked with an advocacy group for undocumented students and Dream Scholars. Borrayo helped create the department’s honor guard, provided dignitary protection to several high-profile campus visitors, and established a collaborative relationship with the District Attorney’s Office. Borrayo also received a number of awards, including the H. Thomas Guerry Award, Meritorious Unit Citation, Exceptional Service Citation, Police Officer of the Quarter Award, and Supervisory Certificate from California Peace Officers Standardization Training. “Sergeant Borrayo has left an indelible mark on our campus community, and he will be greatly missed,” Yang went on. Borrayo is survived by his wife of 15 years, Carrie, his mother, Elbia, and his two stepchildren. A memorial service was held last Friday that drew law enforcement officers from throughout Santa Barbara. UCSB police officers have been wearing mourning bands over their badges in his memory. A memorial account for Borrayo has been set up at the Lompoc Community Bank.